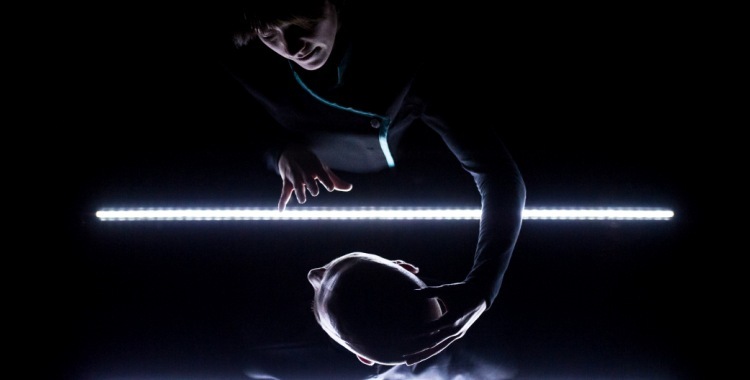 If the Thought Police are an uncertain, shadowy presence in Nineteen Eighty Four, somewhere between self-regulating myth and chilling reality, then in Theatre ad Infinitum’s new show they are a constant presence. Light imagines a world in which, thanks to new technology, not just our actions but the workings of our minds are under surveillance. In light of Edward Snowden’s revelations about the extent to which we are routinely monitored, it doesn’t seem miles from plausibility. Given what we have learned about surveillance, there is no doubting the necessity of discussing its dangers – especially considering the astonishing lack of outcry about the current situation. Theatre ad Infinitum do so through the means of sci-fi and dystopia, genres which often have more to say about the present than the future. This particular future is a grim one, where fears of terrorism have been harnessed as a means of robbing citizens of their basic right to privacy. And there is something chillingly uncanny about the rhetoric with which these imaginary politicians put a positive spin on the ability to see into the minds of others. Light is over reliant, however, on the metaphor that gives the show its title. Light is used by GCHQ as a codeword for meta-data, but it also has the advantage of creating some rather striking images on stage. Theatre ad Infinitum take this connection and run with it – so far that it almost pulls the show off its intended course. The company’s central visual device is the use of LED torches, which only illuminate limited segments of the stage at any one time, leaving everything else in the dark. This allows for several startling, nightmarish moments, as well as some slick manipulation of our perceptions. But it is also limiting to the scope of the piece. Where in Translunar Paradise and Ballad of the Burning Star the formal constraints imposed by Theatre ad Infinitum were what made the shows focused and distinct, here it begins to feel like an unwieldy albatross flung across the company’s shoulders. The story, of a citizen who eventually attempts to break the state’s control over the mind and defy his own tyrannical father in the process, is vital to the show. But thanks to the formal limitation, its telling is not always clear. The action is wordless save a few short projected sentences, underscored instead with an impressive – and often impressively thumping – soundtrack. It is often more cinematic than theatrical and it is not helped by the restrictive space and limited sightlines found in the Pleasance Dome. One of Theatre ad Infinitum’s greatest strengths as a company is their ability to reinvent themselves with each new production. Light is another audacious transformation, but one that sadly falls short of the high standards set in previous years.